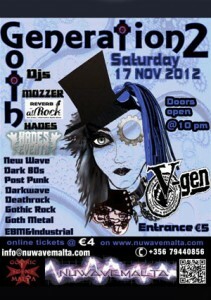 On Saturday 17 November Nuwavemalta in conjunction with the Gothic Scene Malta will be presenting the 2nd edition of GENERATION GOTH @ Voice Of A Generation, PACEVILLE, where the place will be transformed into a Bat Cavey ambient entangled with cobwebs and bats… Pertaining Videos on the Walled Screen…Open for those that love the dark side of the musical waves… Deejays MOZZER & HADES will be indulging us with the sounds of New Wave / Dark 80s/Post Punk/deatrock/Darkwave/Gothic Rock/Electronic Body Music & Industrial Music. in a Bat Cave Atmosphere…. 5 Euros @ the door.